Wow! 70! What an accomplishment! 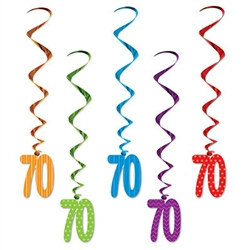 Use these colorful 70 Whirls for a birthday or anniversary celebration. Each package includes 5 whirls, 1 of each color; orange, green, blue, purple and red. A string is attached on one end for easy hanging from ceiling, walls and tables. The whirls were large and nicer than we expected.